Trevor Graham, the coach of disgraced sprint trio Justin Gatlin, Marion Jones and Tim Montgomery, has been found guilty of perjury in San Francisco. Graham was charged with three counts of lying to agents investigating the Bay Area Laboratory Cooperative (Balco). That investigation was sparked when Graham sent a syringe containing a previously undetectable steroid to the US anti-doping authorities in 2003. The jury found him guilty on one count but could not agree on the other two. When questioned in June 2004, Graham distanced himself from Angel Guillermo Heredia, a former Mexican discus champion turned Texan steroid dealer. The North Carolina-based coach had been granted immunity from prosecution on the proviso he did not lie about his own doping activities. Graham told the agents he had never referred his athletes to Heredia for illegal performance-enhancing drugs, met Heredia in person or talked to him on the phone since 1997. It was on the last of these denials the jury found the 44-year-old Jamaican guilty of lying - the votes were 10-2 and 11-1 in favour of prosecution on the other two charges. Graham, who now faces up to five years in prison, could still be retried on the remaining counts at a later date. But jury foreman Frank Stapleton told reporters afterwards he hoped there would be no second trial. "The government was bound and determined to make an example of the defendant," said Stapleton, who voted to acquit on both of the deadlocked charges. "To achieve their goal they felt it was necessary to do a deal with a true devil (Heredia), an untruthful drug dealer and an illegal immigrant. "I hope this verdict satisfies the Justice Department's lust for blood in this matter and that there will be no retrial." Heredia gave evidence against Graham last week, as did five of his former athletes, including Olympic gold medallists Dennis Mitchell, Antonio Pettigrew and Jerome Young. They claimed Graham advised them to use illegal substances and helped provide the drugs themselves. Pettigrew also confessed to having been on drugs when he helped the US beat Great Britain in the 4x400m at the 1997 World Championships and when the US denied Nigeria at the Sydney Olympics. Graham's lawyer William Keane dismissed the witnesses as tainted and unreliable, and suggested his client has become a scapegoat for shamed athletes looking for excuses. He also claimed Thursday's decision was a victory for his client. "The jury obviously had problems with the government's case on the other two counts," he said. "As we've maintained all along, we don't believe the government could prove the case." 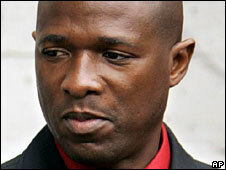 Keane added Graham would probably seek a judgment for acquittal in spite of the jury's guilty verdict. The irony for Graham, however, is that his whistle-blowing, which Balco owner Victor Conte has described as an act of jealously, has ultimately brought him down too. Having been given traces of Balco's premier doping product, tetrahydrogestrinone (THG) or "the clear", the US authorities were able to develop the test that eventually trapped a number of leading athletes, Britain's Dwain Chambers among them. The subsequent fall-out has already seen eight people - including Jones, who won five medals at the Sydney Olympics, and Conte - plead guilty to a variety of charges. Jones's fall from grace was the most dramatic as she had vehemently denied doping for years. She was eventually forced to confess when confronted with irrefutable evidence compiled by government investigators. A tearful Jones was sentenced to six months in prison for perjury in January and is currently serving her sentence in Texas. Her former boyfriend Montgomery has been sentenced to four years after pleading guilty to cheque fraud. The one-time world 100m record-holder has also admitted doping and awaits trial for dealing heroin. Gatlin, the last of Graham's most renowned athletes, is currently appealing against his four-year ban for failing a drugs test in 2006. Graham, who won a silver for Jamaica in the 4x400m at the 1988 Olympics, is only the second person caught up in the Balco affair to be convicted after a trial. He joins track cyclist Tammy Thomas, who was also found guilty of lying when she denied taking steroids.